The British heavyweight boxing scene just added another player to its ranks with the announcement, via Kevin Mitchell of the Guardian, that 2012 Olympic super-heavyweight gold medalist Anthony Joshua has decided to join the professional ranks. Joshua won the Olympic gold last year with a controversial victory over defending champion Roberto Cammarelle after a judges’ countback. Behind after the opening two rounds, Joshua valiantly fought back to earn a draw on the judges’ cards, thereby triggering the countback, which involves tossing out the highest and lowest scores from each fighter’s cards and recalculating the scores on the remaining ones. 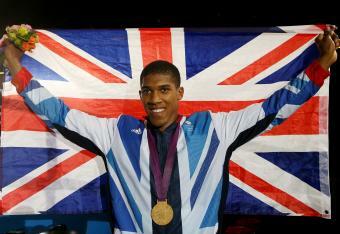 Following his Olympic gold, Joshua signaled his intent to remain an amateur and try to follow up his Olympic success with a World Championship gold, having missed out on gold in the 2011 World Championships by just one point. In choosing to become a professional fighter, Joshua joins a British heavyweight scene that is quickly approaching the cramped level. Fellow Brits David Haye and Tyson Fury are set to fight in September, with the winner hoping to earn a shot at Vitali Klitschko’s WBC World title. Dereck Chisora got back to winning ways with a controversial stoppage of previously undefeated American Malik Scott. David Price has seen his stock fall somewhat after back-to-back stoppage losses to veteran American fighter Tony Thompson. Britain’s first ever Olympic super-heavyweight gold medalist, Audley Harrison, refuses to stay out of the ring. After Chisora’s victory over Scott, Harrison took to Twitter to declare his availability for a September showdown. Richard Towers is a promising prospect who is ready to make a step up in his level of competition. His bout against Lucas Browne was recently scrapped after he was denied an Australian visa due to a past conviction for kidnapping. Also climbing up the British heavyweight list is Tyson Fury’s cousin Hughie Fury. Having only joined the professional ranks this year, the 18-year-old Fury has already rattled off eight victories from eight contests as he seeks to beat Mike Tyson’s record by becoming the youngest heavyweight champion ever. Now with Joshua, another tall and rangy heavyweight, stepping into the professional ranks, the British heavyweight scene is really heating up. While Joshua will take it slowly and steadily as he makes the transition to professional fighting, he certainly has the talent to be competing on a high level within a few years.